The Norwegian government allocated NOK 9.5 billion (USD 1.1 billion) late last year to handle another influx of asylum seekers this year that so far hasn’t materialized. With weekly arrivals now just a fraction of what they were, the battle is already beginning over what should be done with all the money. Norway’s immigration agency UDI confirmed earlier this week what Immigration Minister Sylvi Listhaug already had been talking about before heading off on summer holidays: 1,678 asylum seekers arrived in Norway during the first half of this year, compared to 31,145 last year. It’s the lowest number since 1997. Norway currently has capacity for 35,462 refugees at asylum centers alone nationwide, which currently are accommodating 22,782. That means several asylum centers are likely to be shut down, including the one in the Arctic city of Kirkenes that handled the influx of asylum seekers from Russia last year. Not a single asylum seeker has crossed the Russian border into Norway at Storskog so far this year. DN reported that when Norwegian officials were scrambling to handle last year’s influx, the government diverted money from its foreign aid budget, reversed a planned cut in Norway’s fortune tax and dipped into the country’s sovereign wealth fund known as the Oil Fund. Solberg wouldn’t promised that the money will now be re-diverted back or to any other concrete areas. “There are surely many people who have opinions about what we should do with the money, but we must remember that we have some major and important priorities we need to carry on with, like securing omstsilling (the restructuring of Norway’s economy to make it less oil-dependent) and making sure people can find jobs,” Solberg told DN. She also cautioned that Norway may experience another influx of refugees this autumn like it did last year. Norway’s national organization for asylum seekers NOAS thinks the government should take the initiative to relieve the burden on countries like Italy and Greece, which have been asylum seekers’ main entry points into Europe, and relocate them to Norway. More than 70,000 boat refugees have arrived in Italy alone since January. 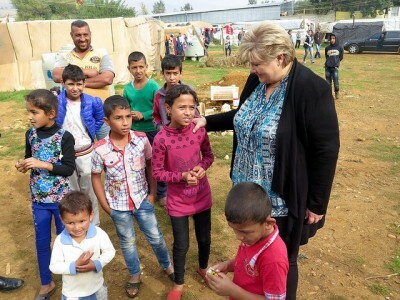 Solberg responded that Norway is already helping Italy and Greece with funding to provide for the asylum seekers, through the Frontex patrol and rescue operations and by agreeing to take in 1,500 refugees who will be relocated. “We have high costs tied to this,” Solberg said, adding that her government would reexamine allocation of the NOK 9.5 billion already set aside this autumn.